Child Development Center, it is believed that the early years are critical in children's development and that the quality of the care they receive early in their lives will have a long lasting effect. 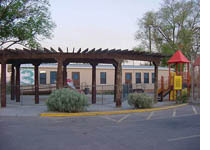 Tres Manos offers a unique combination of quality care, early childhood education and parent involvement. Tres Manos Child Development Center provides low cost, high quality child care to a limited number of CNM students. The center is conveniently located at 832 Buena Vista SE, north of the Heights Community Center and is available Monday through Friday, from 7:00 am to 5:30 pm. Tres Manos takes pride in its low teacher/child ratio. Weekly fees depend on family income and number of family members. Tres Manos provides free nutritious breakfast, lunch, and snacks to qualified participants. A waiting list is maintained at Financial Aid and Scholarship Services at Main campus. To have your child placed on that list or for more information, complete an application at either Main, Montoya or Westside Financial Aid and Scholarship Services office. Applicant must be enrolled at least half-time (6 credit hours or more) or attending at least 8 hours of Adult Basic Education classes a week. Participating children must be between the ages of 3 and 5 and be potty trained. A child is ineligible once they begin kindergarten.